Using a scoreboard for everything you do in practice can help visual learners succeed, and Jackie Richter, head coach for Lakeville North High School and the Northern Lights Junior Olympic Program, explains why in this video. Coaches often nag players to try to get the results they are searching for. But visual learners have a hard time knowing what's expected of them if they're only getting verbal cues. Adding a scoreboard helps them understand rapidly because they become motivated to make the improvements required to score points. It can become frustrating as a coach when your athletes are only focused on the outcome rather than the process and the fundamentals. Creating a scoring system for even the most basic skills can inspire competitive athletes to work hard at any skill the coach desires. Richter explains that “your learning zone is not your comfort zone,” so making things like skill-building or communicating a competition in practice can help with the growth and development of athletes by pushing them past their comfort zones. For example, there can be a scoreboard put in place to track each time a player calls a ball. Players who refuse to call the ball will have zero points on the scoreboard and will lose the drill despite the outcome of any of their physical contacts. This will motivate players to change their behavior. When coaches assign a scoring system, it's important that they're clear on the main focus of the drill, and it's also important that they only give feedback toward achieving that focus. This allows players and coaches to be on the same page about what the emphasis of each contact should be and how it will improve the team as a whole. 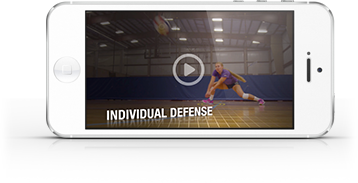 Coaches can repeat the same drill but change what they award points for and the drill will have a whole new purpose. Players will naturally match their efforts toward the skill that will earn them the most points. Coaches can also have more than one scoreboard involved in a drill in order to track different positions or different skills at the same time.